Yoga was originally developed to allow you to open your body and clear your mind. The practice enables you to sit and meditate without worrying about what was going on around you. Giving the gift of mindfulness, you can work towards physical, mental and spiritual growth in a fun, inviting and relaxed community setting. What’s the difference between yoga and meditation? While the words “yoga” and “meditation” are often used interchangeably, they are actually very different. Yoga literally translates as “to yoke (or unite) with God”. The asanas, or poses, are a stepping stone to connect to a Higher Power. While meditation gives you a deeper sense of who you really are, helping you feel complete. Yoga is a series of stretches designed to help you maintain physical and psychological fitness. When practised regularly, it gives you all-round fitness, improves your posture, strengthens your immunity and energy, assists in weight loss and gives you a more balanced reaction to stress. Meditation involves no physical exercise or movements. Rather, you sit for a period of time and focus on the flow created by the energies of your body. It is considered an important part of yoga, and is often performed after the exercises. Is yoga a form of meditation? Yoga and meditation are often performed together. This is because the maintenance of your physical and psychological fitness naturally complement each other. As such, many yogis practice yoga in preparation for a meditation session. Practising yoga before mediation is an effective way to prepare your body and mind to de-stress and contemplate life’s biggest questions. Surprisingly, though, while often practised together, yoga and meditation are in fact separate exercises. When you examine the two closely, the differences become clear. Yoga chiefly focuses on physical fitness, whilst meditation involves focusing your mind on a particular issue or question. Regularly practising different yoga postures are the perfect way to prepare your body for meditation. In fact, these postures were originally designed to ready your body to meditate. However, as yoga has undergone dramatic changes over the years, the link between the two is not always clear. Meditation and yoga and interlinked, they work together to unite our physical self with our higher self. One can’t exist without the other, as we need to be aware of our bodies in order to let them go. The relation between meditation and yoga is particularly clear in Ananda Yoga (or Higher Awareness). All asanas, or poses, in this style follow a specific routine to direct energy into your spine, magnetically direct this energy into your brain, and to awaken and lift your consciousness to a higher level. Should I combine yoga and meditation classes? 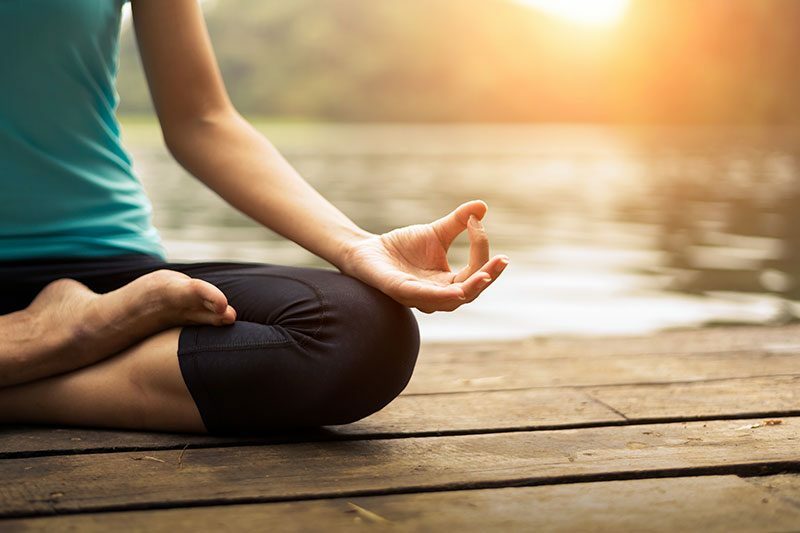 While yoga and meditation are not the same – meditation is an aspect of yoga that deals with mental relaxation and focus, they are still connected and bring additional benefits when practised together. According to Patanjali, the original codifier of yoga, meditation was always intended to be an integral part of the exercise. This relation tends to get lost in modern yoga classes however, as most classes do not include meditation. To many dedicated yogis though, meditation is absolutely essential. They recommend yoga before meditation as it prepares your body by helping you sit up straight and still for long periods of time. Also, meditation can help you access parts of your mind and spirit that yoga is not able to access. Asanas, or poses, help you to free up physical tension, make your body stronger and improve your endurance. While meditation clears your mind and lets you explore some of life’s biggest questions, helping you become a more well-rounded person. Which is better, yoga or meditation? Mediation and yoga can both be used to relieve stress and to help you relax. However, each discipline brings its own unique strengths. Yoga is focused on perfecting poses to improve physical and mental health.Yoga improves your balance and is a method of getting your daily exercise and attaining inner peace. Yoga concentrates on the connection between your breathing, mind and body. Yoga is a proven way to improve your sleep and flexibility, reduce pain, fight inflammation and help overcome anxiety and depression. Mediation focuses on using your mind as your key source of connection. Meditation is centred around relaxation and self-improvement. Meditation is a way to learn how to master your mind. Meditation is a great way to increase your self-control, reduce anxiety and stress, and develop empathy, self-awareness and concentration. If you are interested in starting an exercise program which unites your breathing, body and mind, yoga is ideal for you. But, if you are looking for an effective way to relieve stress, relax and explore your inner self, meditation may suit your needs.Mukti Freedom offers combined yoga and meditation classes, so you’ll enjoy all the health benefits on offer across both these ancient disciplines. For thousands of years, yoga and meditation have been used as an alternative form of exercise to keep your mind, body and spirit happy and healthy. Regular yoga sessions improve your balance, flexibility, strength and endurance, while meditation keeps your mind active, reduces stress and anxiety and strengthens your immune system. Stretching exercise, coupled with certain asana, or poses, can treat chronic back pain by improving spinal flexibility and improving spinal alignment. Using blocks, belts and other positioning props, Iyengar yoga has been shown to significantly calm rheumatoid arthritis symptoms. Hot yoga varieties, such as gentle yoga and Bikram yoga is also helpful, due to its slow, gentle poses. If you suffer asthma, yoga is the perfect workout for you. Pranayama yoga focuses on breathing techniques, which helps you to manage symptoms more effectively. If you have trouble falling asleep or suffer from insomnia, yoga may dramatically improve the quality of your sleep. Practising meditation and breathing clears your mind and slows down your thought process, giving you the peace of mind to sleep well. Meditating is a quick mood booster. It improves your cognitive-behavioural performance, along with helping you effectively manage mood swings, menopause, schizophrenia, anxiety and depression. Taking the time out to meditate keeps your mind active and clear. Simple breathing techniques help to organise your mind, keeping it free of clutter. Slow breathing also improves your memory, organises your thoughts, and rids you of stress and negative thinking. We understand that if you have never tried yoga, it can seem quite intimidating. We help you to ease into the ancient practice with relaxing private sessions. In a relaxing, one-on-one environment, you will: learn the basics of yoga, discover your capacity to practice these techniques (while taking your health into account) and learn practical tools to cope with the challenges of daily life. By attending our yoga classes on a regular basis, you will gain mental and emotional balance as you learn – traditional yoga poses, breathing techniques and to relax your body and mind through peaceful meditation practices. Are you struggling to fit yoga into your busy schedule? If so, individual sessions are the perfect solution. Private consultations help you understand how to approach difficult situations with yoga psycho-management, along with Choice Theory and Reality Therapy. You will discover your inner driving forces which motivate your chakra energy centres. We help you understand that the inability to address your needs negatively impacts your thinking, acting, emotions and feelings (physiology). We will give you the tools to express yourself constructively. This health care modality involves applying needles very lightly, giving deep foundational energetic and physical support. Applying needles lightly to the skin in specific patterns restores harmonious balance and order to your energetic state of being. This helps your body return to its natural vitality. Choosing the right yoga instructor for your needs and lifestyle is not always an easy task. As yoga and meditation are incredibly personal journeys, it is essential to put yourself in experienced hands. That is exactly what you will find at Mukti Freedom Yoga. A sign of a great yoga teacher is a true passion for what they do. This shows in their excitement for yoga and their joy in seeing their students grow and progress. Good yoga teachers are 100% committed to their craft, and it shows in their personable teaching style. They guide students through different poses with patience and understanding, and want nothing more than to see them succeed. The genuine desire empower students is another thing setting good teachers apart from the rest. They understand that yoga is about more than mastering poses – it’s about gaining self-worth and inner peace. How much do yoga and meditation classes cost? We believe everyone should be able to access top quality yoga and meditation classes, taught by qualified teachers. So, we offer group yoga and meditation sessions that everyone can afford. What can I expect from group yoga classes? Our group classes are expertly crafted to cater to people of all ages, fitness levels and levels of experience. Whether you want to harness your inner peace or improve your physical health, our group yoga classes are perfect for you. During these classes, we will help you connect your breathing with gentle movement, in a series of breathing exercises, static postures, vinyasa and meditation exercises. We guarantee you will leave each class with a sense of serenity and inner peace. What can I expect from group meditation classes? Every meditation class is different. In your first class, you may become restless and frustrated as you learn to connect with your inner self. Once you have learned to apply these exercises, you’ll find yoga and meditation classes incredibly relaxing. Your teacher will discuss the practice with the group, before leading you into some meditation exercises. Through these exercises, you will learn to become aware of your thoughts. The goal is not to attach a story to them, but rather to bring yourself to the present moment, with compassion and no self-judgement.